If you need the best backpack diaper bag for twins, we have you covered. Choosing the right diaper bag can make a big difference when it comes to family outings. In the past, there was only one choice, and everybody had to bear the same pain from those stiff, duffle-style diaper bags. Without the extra pockets, there was never enough room which meant you had to carry additional bags and even a cooler to keep the bottles cold. By the time you were finished packing you were too tired to go out anywhere and staying home seemed to be easier than toting the entire house with you. Long gone are those days because the choices of today are great, and the designs are meant for you to enjoy your outings rather than to become overwhelmed and tired before you even get started. If this is your first time choosing a diaper bag you might feel a little overwhelmed, especially when choosing the best backpack diaper bag for twins, but don’t fret, we’ve got you covered. We will tell you what you should look for, we will give you some of the best choices of bags you can buy, and we will even give you a checklist of the things you will want to keep in the bag. When you’re finished with this guide, you should feel relaxed in knowing that this is one choice made simple for you. Pockets– The number of pockets the bag has is important for staying organized. Be sure the bag provides insulated pockets that are large enough to hold two or more bottles. You might also consider a bag that will provide a place for your belongs too so you won’t need to carry a purse. Material– This is important because you don’t want something that will rip or tear easily. Material that is waterproof and can be washed is an added bonus since you’re bound to incur a lot of messes along the way. Handles– The style and number of handles are important; some bags offer carrying handles in addition to the back straps. The more ways you can carry the bag, the easier it will be for you. Versatility– A bag that you can carry both on long trips and short trips will be helpful. Consider a bag that can be stowed away under the seat when you’re flying and a bag with stroller straps will make your life easier when you have additional luggage or the bag is too big to fit in the basket of the stroller. Style– As we mentioned before, style is important because you will want something that is easy to carry, yet stylish enough for anyone in the family to use. Some bags are offered in different colors while some are neutral enough to blend in anywhere. Now that you have a better idea of what to look for, we have compiled a list of the five best backpack diaper bags for twins that we could find. This is a two-for-one backpack with a ton of pockets and enough room to accommodate everything you need for your twins, your toddler, and even yourself. This bag provides all the room you need for a long trip or a short trip. The seventeen pockets give you the space to carry all the baby’s necessities plus an additional pocket for your laptop or iPad. You can carry two bottles in the oversized insulated pocket and your wipes will be at your fingertips from the convenient side pocket access. There is a wet pocket also provided so that you can keep your baby’s mess away from all the dry stuff in the bag. It comes with stroller straps so that you can keep it close by without having to dig it out from the basket underneath and you will even find a convenient diaper changing pad tucked away inside for those messes on the go. This bag is so versatile that you can easily detach the smaller bag and allow your younger children to carry their own little things on their back. What Makes this Bag the Best? Consider the versatility of this bag allowing you to carry two bags in one for long trips or choose one of the two for shorter trips. You can easily carry everything you need for your twins and still have enough room left for your other child’s needs and don’t forget about the added pocket for your electronics. 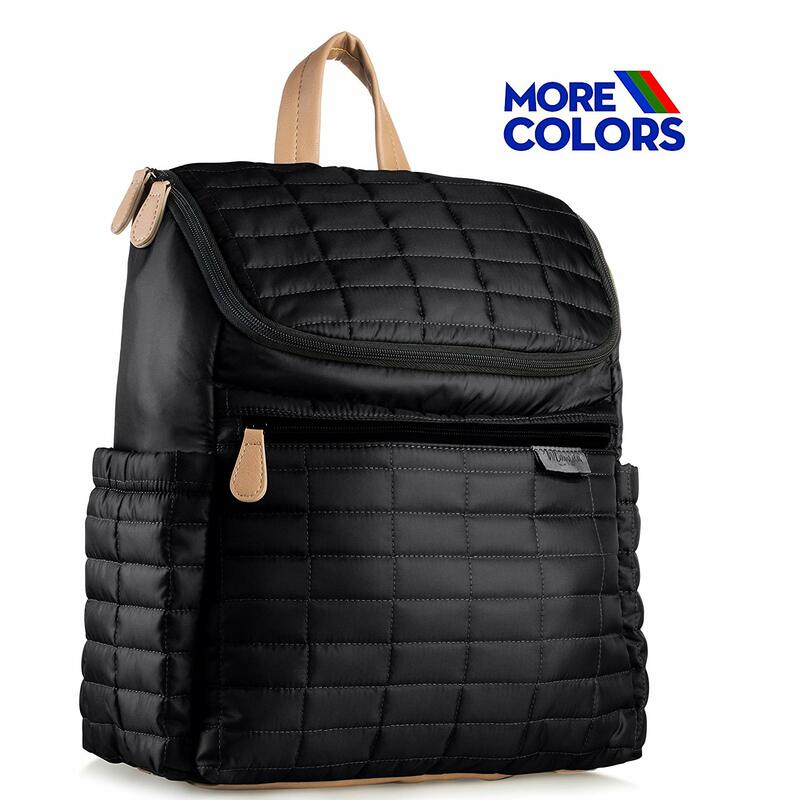 This backpack will make a great companion for walks through the airport, trips to the zoo, or just a day of shopping at the mall. You could even keep the smaller bag packed in your car for emergency runs. 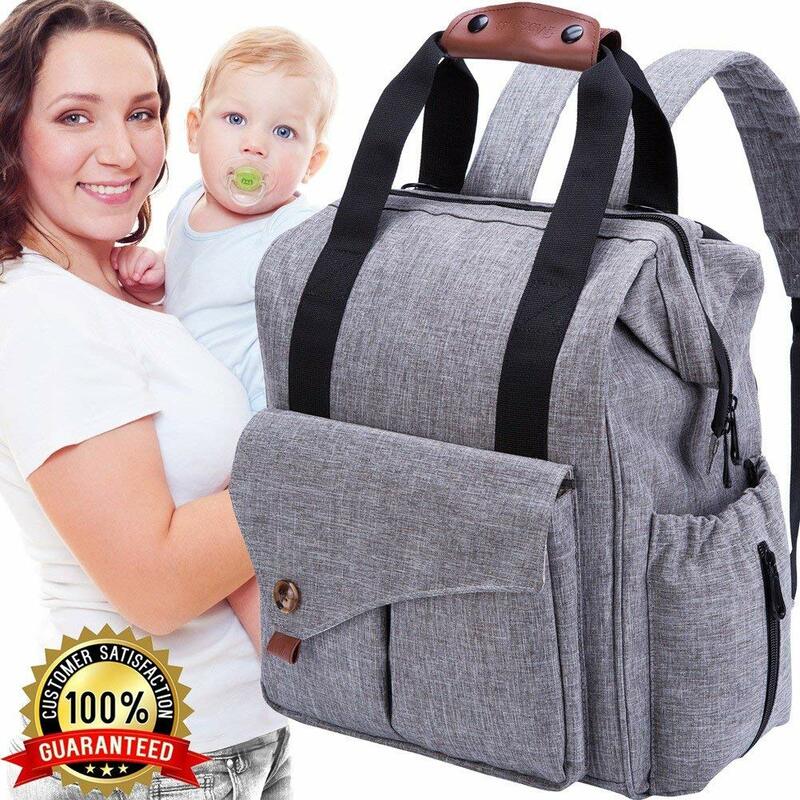 The versatility, quality, and comfort of this backpack diaper bag make it all worth the investment. You should definitely consider this when choosing the bag that’s best for your needs. 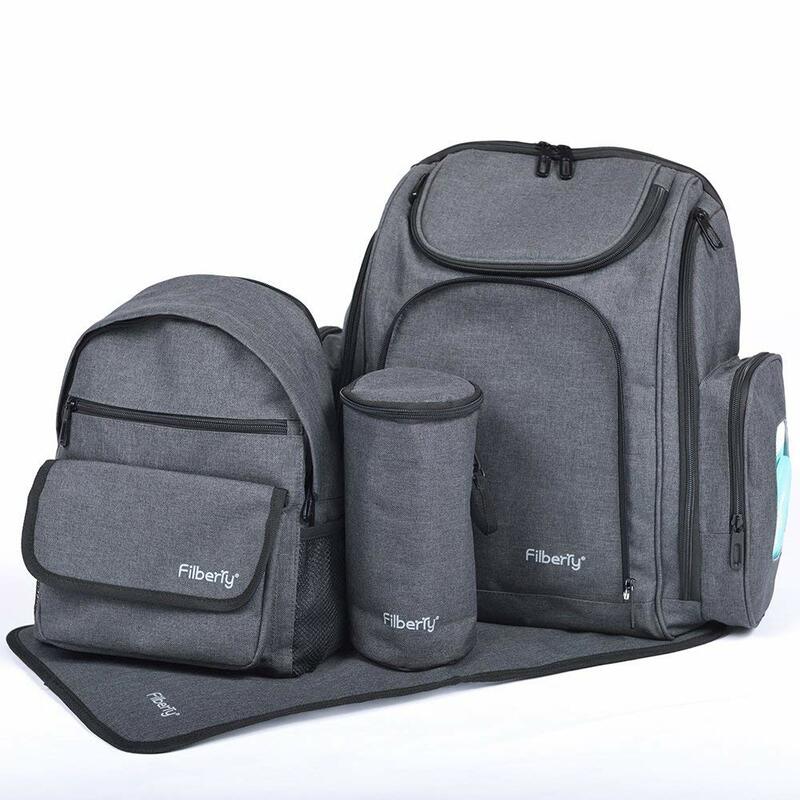 This bag is perfect for a parent with twins as well as older children because it provides more than enough room for all the essentials you will need on any day trip you venture out on. 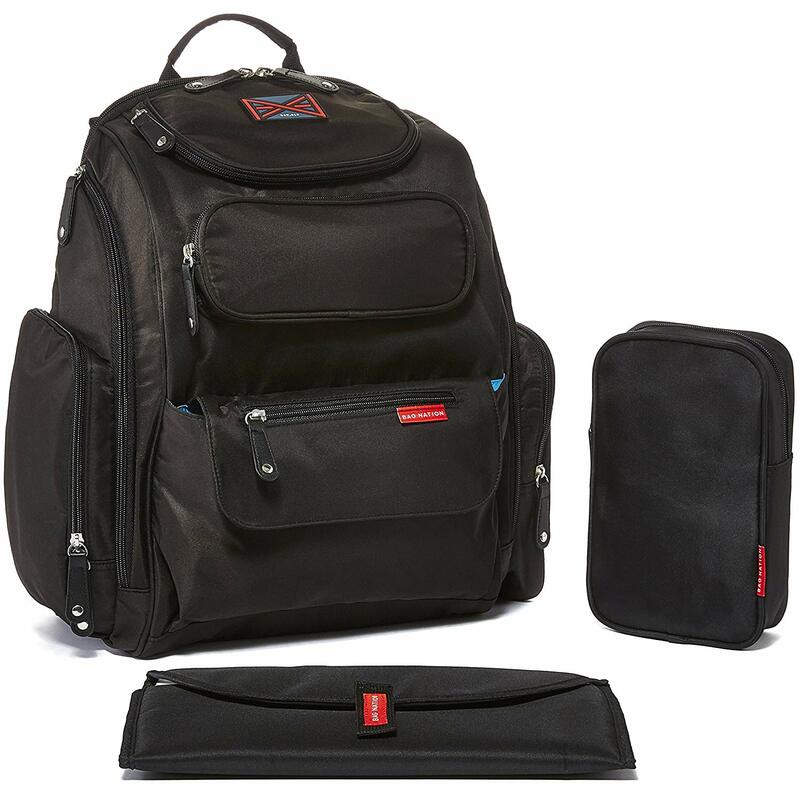 With fourteen pockets you shouldn’t have the need to leave anything behind. There is plenty of room for all the diapers you will need for your twins and even enough room for multiple pairs of extra clothing. You can carry two bottles in the extra-large insulated compartment on the outside of the bag, and the included sundry bag will allow you to carry diaper rash cream, lotions, and necessary medications. It comes with a diaper pad for changing your baby in public and you can conveniently strap the backpack to your stroller. You won’t need to scramble through the bag for the wipes because a convenient pocket was strategically placed at the side for easy access. The straps are sturdy and comfortable, and it provides a handle for easy maneuverability. The zippers are strong and secure assuring your essentials will stay in place throughout the duration of use and you will have two color choices to please you and your spouse. Think about how easy your life will be with this pack on your back. It’s made of polyester and it’s water-resistant to keep your things on the inside dry. It’s not machine washable, but it does wipe off to look like new and there are more than enough pockets to keep everything safe and secure. You have the option of carrying it on your back or with a handle and you can strap it to the stroller for convenience. It’s constructed of high-quality materials and it won’t fall apart when it gets wet. With its large number of positive reviews and the fair price, you can see why this one made it to the number two spot on our list. This backpack might look basic, but don’t judge it by its looks because you will be surprised at how much room this one will provide you. This is the perfect bag for traveling with more than one baby and even your toddlers! It features fourteen pockets plus the large main compartment that will hold diapers, clothing, toys, and other necessities. You will find a thermal bottle pocket on the outside that is big enough to accommodate two bottles, a perfectly placed wipes pocket on the side, plenty of additional zippered pockets for extras, and even enough added room for your electronics! It doesn’t have a carrying handle, but the shoulder straps are comfortable, and it even comes with stroller straps that easily attach the bag to the stroller handle. 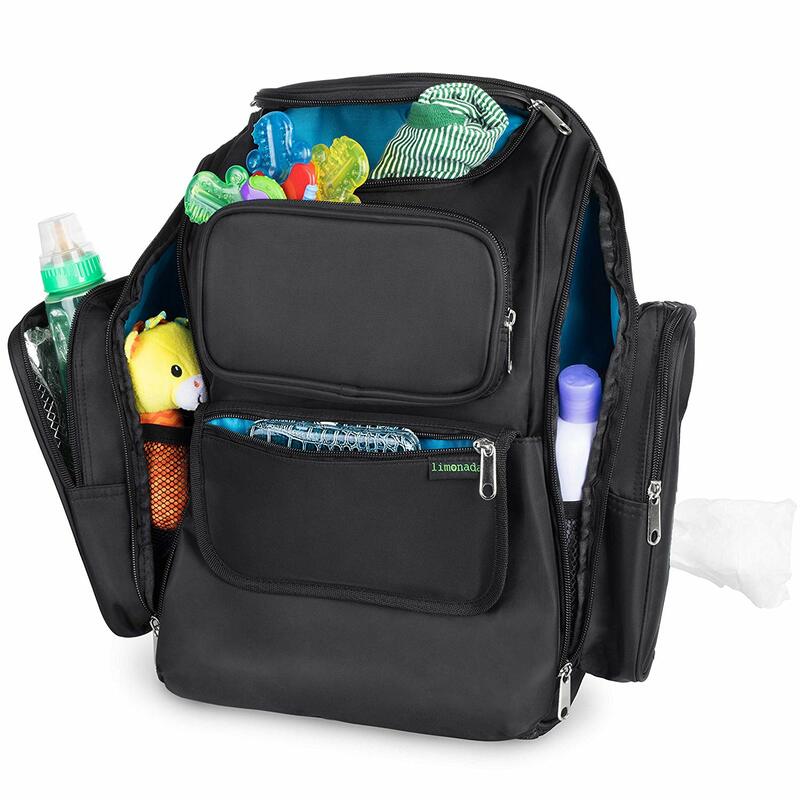 In addition to the stroller straps, this backpack also comes with a changing pad and a cosmetic sized bag for your baby’s medicine, thermometer, nail clips, lotions, and all the other little things you might need on the go. 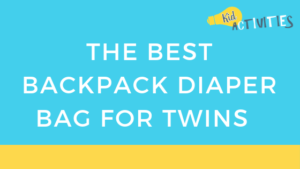 With all the amazing features equipped with this bag, it’s easy to understand what makes this one of the best backpack diaper bags for twins on this list. No matter if you are traveling with one baby or the entire family, you should have enough room for all the essentials you will need while you are away. The design of this bag makes it easier to sit up straight so that it won’t tip over as easily as others and it isn’t as bulky even when it’s stuffed full. One of the best things about this bag is that it can be machine washed, and that’s important when unexpected messes happen. This bag is one of the most popular with consumers and it holds a high rating, so you should consider putting this one on the top of your list when making your decision. This extremely spacious diaper bag backpack is bigger than it looks and will hold everything you need for a day out on the town or a trip to Grandma’s house. This bag is smaller than the others with only nine pockets, but that’s what makes it perfect for a day trip, and yet, it’s still big enough to hold everything you need for your twins. Unlike the others on the list, this one features three separate insulated pockets for bottles, so you will also have an additional pocket to carry a drink for an older child. There are pockets on the outside front that snap closed with a magnet, an outer pocket at one end, and the other end provides a pocket for the wipes, and although the wipes pocket might seem a bit tighter than you would expect, it will keep them securely in place. You have the option of snapping the handles together to carry it by hand, easily slide it on your back, or conveniently snap it onto the stroller. This bag even provides an additional padded pocket for your smaller items such as your keys, phone or money so that you won’t need to carry a purse with you. It’s constructed of quality, waterproof materials and the straps are all designed for comfort. If you’re looking for a bag that is perfect for a day trip, this is the one for you. Although there may not be many pockets in this bag, they are spacious and this one provides room for more bottles than the others on this list. It’s designed with your comfort and convenience in mind and you won’t have the need to carry a purse when you have this bag at your side. It holds strong reviews, it wipes clean nicely, and it’s affordable, what more could you ask for? This bag could easily be packed and kept aside for emergencies and it’s compact enough that it will stow easily under seats or you can keep it tucked away in a camper or boat. There are so many reasons this bag should be one to consider. This is another great bag for a day trip to the mall or a play date at the park. The unique design of this one makes it perfect for the outdoors. The unique design of this bag is like none of the others on our list. It provides eight spacious pockets including two external pockets lined with insulation for your bottles. An additional pocket was added for you to store your important essentials such as your keys, phone, money, ID, and credit cards. The quilted design is made of polyester on the outside and the inside is lined with nylon. The bottom is made to stand flat and is covered with leather so that sharp objects won’t poke through and cause a hole or tear in the material. Although this bag doesn’t provide easy access to the wipes like the others do, there is a separate pocket on the side that you can use for storing them. This bag features zipper closures, a single carrying handle, comfortable back straps, stroller straps, and it is offered in five color choices. If you frequent the waters by boat, then you must consider this backpack diaper bag. It stands flat on the leather bottom, so you won’t have the worry of it spilling on the wet floor and it simply wipes off when it gets dirty. It offers just enough space for a day trip and it might even provide enough room for an overnight adventure. Since it is offered in an array of colors, you can be sure that either parent can carry it without embarrassment. It’s a simple bag, yet spacious and user-friendly. It is a favorite of many and the price will satisfy any budget. Consider this as the best backpack diaper bag for your twins. There you have it, 5 of the best backpack diaper bags for twins.